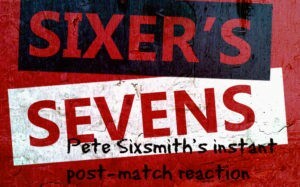 Malcolm Dawson writes…..this was a game that rarely got the pulses racing but was decent enough entertainment I thought. I suppose you’d have to say there was a reasonable crowd there but not that many that there was any need to queue for the loos or park miles away from the ground. But there were still a few who felt it necessary to get up and go five minutes before the half time and full time whistles. Perhaps they didn’t know about the extra point penalty shoot out but there were still some who stayed for the first three or four then left before the result was decided! This is still a competition with a chance of getting to Wembley. I’ll be interested to see how the crowds develop if we were to progress and the chance of a trip to the capital were to become a distinct possibility. Jack Ross made it clear how he sees this competition and used the game as an opportunity to give some of our summer signings, Flannagan, McGeuch, Wyke and surprisingly and encouragingly Sinclair some match fitness whilst also taking a look at a few of the academy graduates in a match situation. I was there. Pete Sixsmith was there and a match report will follow in due course. For now you have my seven word summary. The SAFC vs Fleetwood Town prize Guess the Score: can we spoil Joey’s day? Stoke City, the U23s and the Hetton Irregulars. What more could you want on a Monday Night?